I grew up eating Miracle Whip and hated the taste of real mayonnaise. Over the years, I have developed a taste for the real thing (well, as much of a taste as you can get for mayo!). Mayonnaise is not something I use all too often. When I buy a jar, I use what I need and the rest sits in the fridge for what seems to be forever. The thought of making my own mayo never crossed my mind until this post from Beantown Baker (from Joy of Cooking) came through my feeds. It seemed so easy that I had to try it. And the recipe only makes about 1 1/4 cups, just enough to store in a cute little jelly jar. I whipped some up in under a minute and spread it on some toasted rosemary bread. I piled it high with some lettuce, fresh ripe tomatoes from the garden, and a sprinkle of salt and pepper. A lettuce, tomato, and homemade mayo sandwich may just be the perfect late-summer lunch. I think I will repeat it tomorrow! Add the egg, mustard, salt, sugar, and vinegar to the bowl of a food processor or blender. Process until completely mixed. As the blade spins, slowly stream in the oils. Once the oils have been added, continue to process for about 30 more seconds. Scoop the mayo into a bowl or jar, cover, and store in the fridge. 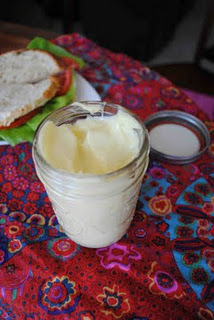 *As Jen notes in her post, you can flavor your mayo with different herbs or infused oils. I think next time I may just use some of my basil or rosemary to give it some extra flavor.